During the winter months building in extra moisture at every step in your routine, is more effective than simply using the heaviest cream you can find. 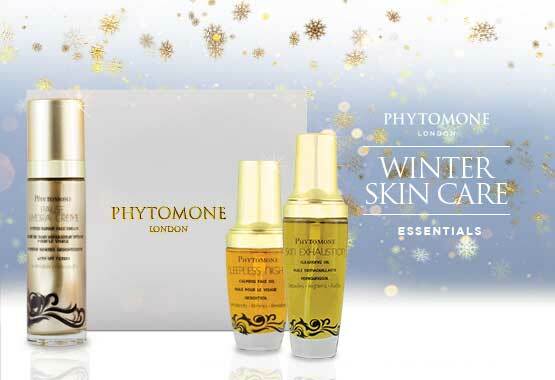 Our Winter Skin Care Essentials Christmas Box includes 3 of our most protective and nourishing products, to ensure your skin is pampered and cared for every step of the way. Cleanse, Exfoliate & Tone with this ONE incredible product. A nutrient dense cleansing oil is a must for every woman over 35, especially during the winter months. Naturally produced oils and moisture decrease as hormones decline. The skin, now also has diminished capabilities of retaining moisture, which can be further exaggerated by cold weather and central heating, leaving skin feeling parched, wrinkles more noticeable and complexion looking dull and tired. 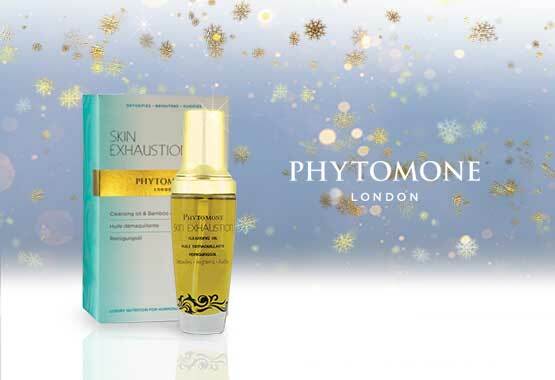 Phytomone Skin Exhaustion Cleansing Oil works specifically with hormonally ageing skin during the changing season. This miracle worker, complete with exfoliating and toning bamboo cloth, deeply cleanses, hydrates, decongests and detoxifies pores, while the zesty natural plant oils brighten and smooth the skin and diminishes signs of ageing. Approved by Nature - 100% Natural. No parabens, No fillers, No artificial fragrance and No mineral oil. Skin ages dramatically once oestrogen levels begin to decline. Without this vital hormone the body struggles to make sufficient collagen, causing dryness, sagging and lines and wrinkles to become more noticeable. Regular moisturisers will no longer be able to address your skin care concerns, as they once did. 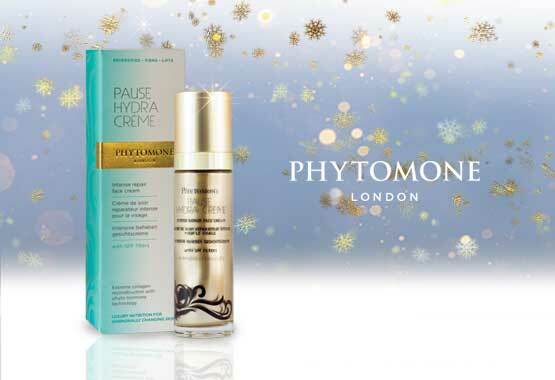 Phytomone Cosmetic HRT™️ found in Pause Hydra Creme, targets skin ageing at the root cause; loss of oestrogen. This restorative cream re-balances and replenishes facial oestrogen receptors with natural plant based hormones, to dramatically increase collagen production. Skin is left looking firmer and smoother. Lines and wrinkles appear less noticeable in just 4 weeks! With long term regular use, you can ensure you skin will carry on looking incredible in the years to come. During the winter months, you may find you need to indulge your skin with a shot of our decadent face oil, to overcome the damaging effects of the harsh cold weather and drying effects of central heating. Give your moisturiser a helping hand in these times of need with our intense Face Oil. Sleepless nights Calming Face Oil is hand made with an exquisite infusion of deeply nourishing, replenishing and hydrating natural plant oils and native hormones. Rich and just deluxe, deluxe, deluxe! This gorgeous face oil treats wrinkles and dry skin, seriously improves elasticity and leaves complexion looking luminous, while protecting your skin from the harsh elements of winter - The perfect partner for our Cleansing Oil and Pause Hydra Creme!